I Am Too Old To Get In Shape - Really??? I am too old to get in shape- really??? The above is something I hear about every other day, either in person, or in the virtual world. In the days of Men’s Fitness and Abercrombie and Fitch ads, it occurs that once you pass 25 years of age you should resort to Bingo and pureed foods. Therefore, I decided to take on the topic of training when getting older. But even though I am scratching 40 myself, this article (for once) is not about me. Meet Bernie Long aka one of the most inspirational chapters in my career as a personal trainer in NYC. He was born around the time when the Japanese attacked a little known place called Pearl Harbor. Impressed by his physique? I am.Now, do not fear! This will not be another boring “Bernie squats and eats his chicken breast” article. Instead, I will attempt to describe the mind set which goes into achieving such a shape at his age. Quick medical history of the patient: no thyroid, back surgery in 2011, cannot turn his head to the right, severe kyphosis (hunched forward), and lastly, no short term memory, as a result of a series of mini strokes. So all in all, not exactly the perfect set up to build a physique like his. How did it happen? The first part didn’t happen all at once; it was more of a gradual evolution of the ultimate goal. When Bernie started training, he was merely doing it to “look better” or “be healthy”. It took a couple years and several trainers until he met Scott Weisse, an extremely knowledgeable and caring coach. He was the one with whom Bernie eventually connected and Scott pushed Bernie beyond his self-perceived limits. From there on, it was a step-by-step process toward his first bodybuilding show. This leads in the second point. In order to succeed, you need a support system. MJ had Pippen, Malone had Stockton, the Jets had Tebow, wait…. In any case, you get the point; the better and more talented your training environment is, the better you will do. In Bernie’s case this includes a coach, nutritionist, posing coach (yours truly), and masseur. It obviously depends on your financial means to an extent, but it is yourself you are investing in, so at least consider doing it. At a minimum, you should be looking into books and lectures by accomplished people in this sport; knowledge will get you much further than the latest supplement gimmick. Arnold and Frank Zane were both known to have a very deep understanding of human anatomy, which is one explanation for them being able to build such incredible physiques. I won’t spend more time on the importance on a proper social support system; that should be self evident. 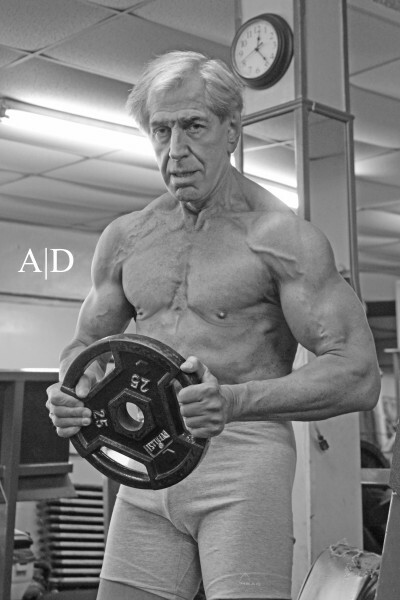 In short, it is hard to get in shape when working for Dunkin Donuts or your inner circle believes that bodybuilding is a narcissistic activity, done by freaks. Moving on to the third part. Taking action almost deserves to be broken down into several subgroups. First, Bernie had to fix himself after multiple surgeries. More specifically, he spent a year working on restoring his balance, learning to turn his head again, and regaining flexibility in his shoulders. A rather tall order, if you ask me. Mostly, he used the Alexander technique to achieve the above. Afterwards, he was ready to start training seriously again and from here he went on to win the Masters Mr Fitness in 2012. Mind you, he still does not have a short term memory, which means every adjustment myself or Scott make to his training or diet has to be jotted down right away. On the bright side, this makes for extraordinary records. The final push: I challenged him to get into photo-shoot shape by offering to cover the cost if he could achieve the conditioning (he certainly proved me wrong). Bernie became a freight train; he was so focused on training and proper dieting, it was simply a matter of time until he had the dry look we all crave. Going to the actual photo shoot with Jimmy Murthaugh and him was one the most rewarding experiences in my professional career. Lastly, mental attitude is often overlooked when it comes to athletic success. All to often, we focus on diet, training, supplements, or drugs, instead of, realizing that, to quote Vince Gironda , “it is the muscle between the ears, that makes the other muscles grow”. Progress does not come linear; there are many setbacks along the way. Staying positive is one of these catch phrases you always hear, but how does one really go about it? I recommend to keep taking pictures of yourself (no need to post them all on Facebook by the way), but just for yourself, so you can look back on where you came from and how far you have come. Also, and this goes back to point two, surround yourself with people who believe in you and can actually push you to the next level. So, why are you still here and not in the gym or in the kitchen? If Bernie’s story has not inspired you, I do not know what will. Previous post: You don’t know how to curl!! Next post: How to manage the holidays dietwise!